I’m slowly getting used to the whole idea of getting messy. LOL. 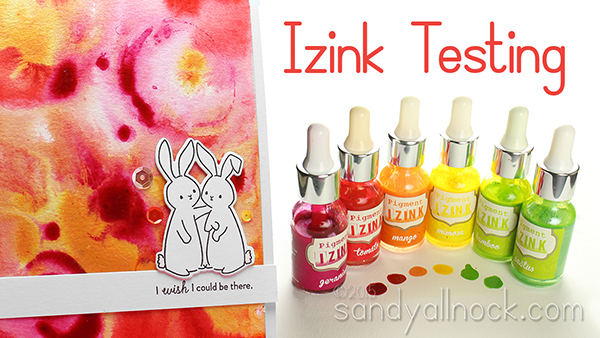 These Izink inks are pretty fun – I’m really intrigued by the possibilities! I was blessed to receive some Izink colors from the good folks at Clearsnap so I could try them out and see what they do. I’ve been seeing them pop up around the web, and was just curious. Acrylic. Pigment. Yet watercolor. I needed to test it, I didn’t believe it was true! Which is another thing I’m slowly getting used to; do you remember the days when I never wanted to get inky and test things? I think I’ve been taken over by aliens! If you’d like to see what these inks’ properties are, check out the video below – or click HERE to watch in HD on YouTube! And see below for a list of which inks have that lovely irridescence to them. #nomnom shiny! 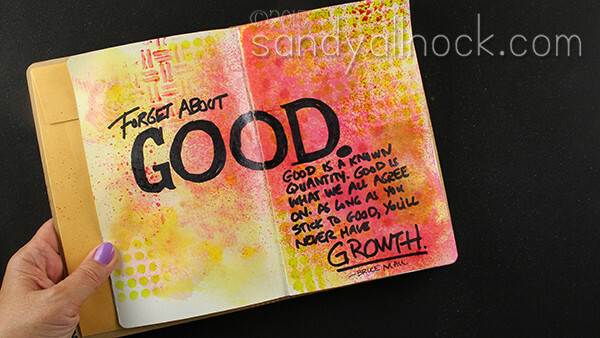 I really do love the quote for the art journal page, too. Good is a known quantity. Good is what we all agree on. Stick to good and you’ll never have growth. I talk to my stamps, as you know. And ever since THIS post where I used a stamp in the Wishing You set as a “sad” bunny sitting in monkeypoop (ya gotta watch the video, it makes more sense than this sounds! ), I was feeling bad for using them in a “mean” setting! I knew I had to post something to counter any bad mojo I would have left on the stamps….so that’s what I did here on today’s cards. LOL. Sorry, bunnies! See, you have my heart. Iridescent : Amethist, Cactus Citronelle, Gold, Mango, Opaline, Orchid, Silver, Topaz, Tulip, and Volubilis. I did a superfast Periscope broadcast today to show the difference in how the Izink and Brusho work in painting roses. Below are the cards that came out of that, with this perfect sentiment that’s on my new ohmygoshIamgoingtouseitalot list…watch it HERE for only 24 hours (until Tuesday am)! I do enjoy seeing someone testing a new (at least to me) product out. It helps me decide if it is something I want to invest in. Thanks for sharing. Great review and such gorgeous and happy colors..love the cards..and the sweet bunnies…I love bunnies..I have two..running around my garden..they are so cute and sweet.. I thought your Bible Art Journal pages were GREAT! They set off that fabulous quote by Bruce Mau perfectly and I totally agree with it. Love the BG examples on your bunny cards too. Thanks so much for the demo on Izinks. Always something new and interesting to buy. Seeing they are an acrylic based medium that acts like a watercolor, should you still apply the rules of keeping acrylic brushes and water color brushes for their separate uses? I know you can use a water color brush for an acryclic but you can’t or shouldn’t go back to water color with it. Probably the easiest thing would keep separate brushes just for this LOL. Nothing like answering your own questions in a quasi way. I love the effects you got and definitely going to try some . Thank you for sharing your artistry, as always. LOVE how the finished cards came out…watched the scope on that and loved it! Because I don’t color well in large spaces, I love using abstract backgrounds for cards. I just received my order of Brushos and now you show me these. On to my wish list they go! I really enjoy your product videos and find them very informative. Keep up the great work. Glad to see the bunnies in a little happier setting today. and I love the art journal page! Please link to monkeypoop video. You have me curious. Love your videos and talent. It’s linked in the paragraph 🙂 Pretty funny! Those colors make me happy! Thanks for being our test lab! Wonderful use of sad bunnies. Did I ever tell you how much of an enabler you are and my wallet screams at you?